Differentiated Assignments is a Canvas feature that lets you create different due dates and availability dates for assignments, quizzes, and discussions. 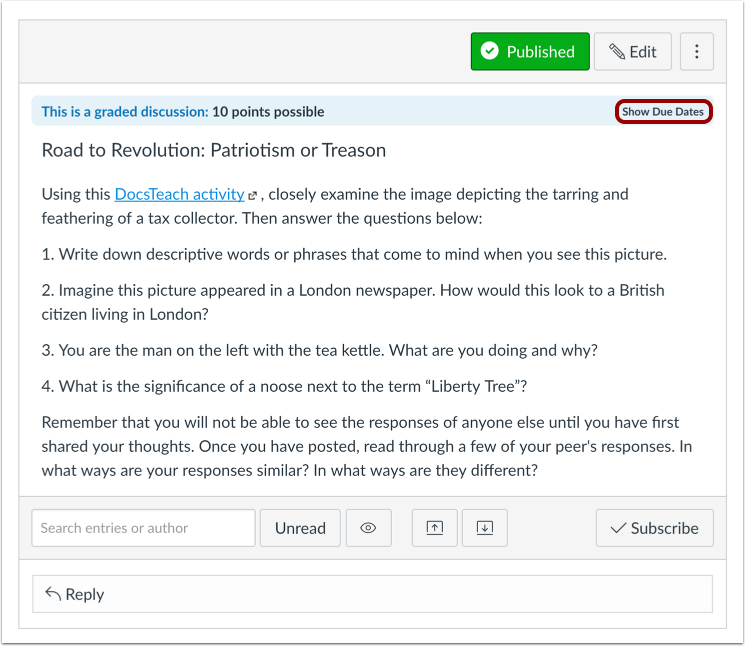 Assignments and graded discussions can be differentiated for individual students, sections, or groups; quizzes can only be differentiated for individual students or sections. You can designate if the assignment will be limited to those students, sections, or groups or if it will also be assigned to everyone else in the course. Differentiated assignments are also used in MasteryPaths. When using differentiated assignments with the Gradebook, the assignment appears as a column for all students, but grade cells are grayed out for students who have not been included in the assignment. Grades cannot be assigned for students who have not been included in the assignment. Additionally, assignments that are not assigned to students—whether individually or as part of a section, group, or entire course—are not factored into overall grades. Differentiated assignments are also respected in Multiple Grading Periods. On the student grades page, students can only view assignments that have been assigned to them. This lesson is an overview of placement throughout Canvas. Differentiated assignments do not affect your students since they will only see the assignment that have been assigned to them. However, when an assignment includes more than one section, group, or user, Multiple Due Dates will appear across your entire course including Quizzes, Assignments, Discussions, Syllabus, Modules, Course Analytics, Calendar, and SpeedGrader. Quizzes that contain multiple users and availability dates will read Multiple Dates on the Quizzes Index Page . You can hover over multiple due date links and view each individual due date . When you click the name of a quiz, the quiz details will also display the number of individual users and dates for the quiz. 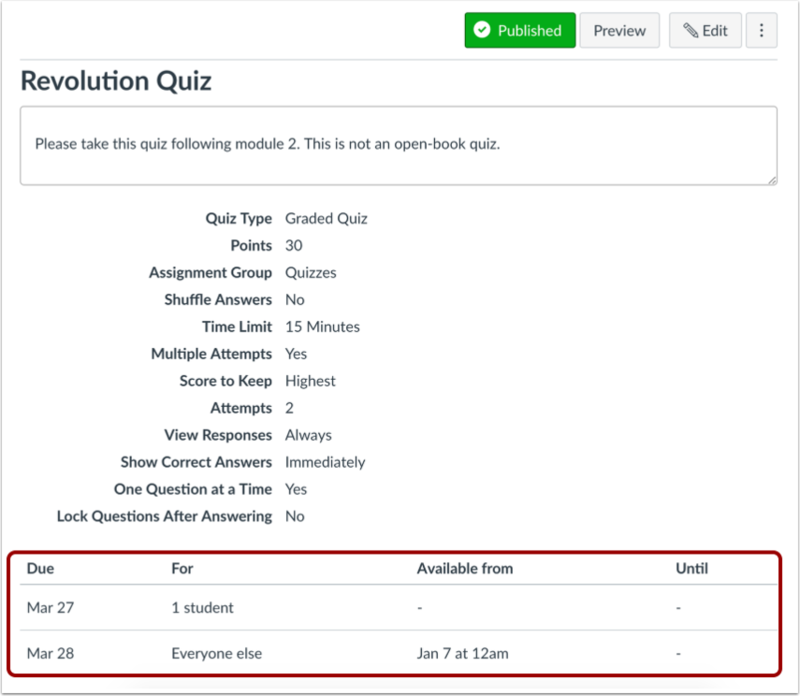 Learn how to create a quiz for individual students or course sections. Assignments that contain multiple users and availability dates will read Multiple Dates on the Assignments Index Page . You can hover over multiple due date links and view each individual due date . When you click the name of an assignment, the assignment details will also display the users and dates for the assignment. Learn how to create an assignment for individual students, course sections, or course groups. Graded Discussions that contain multiple users and availability dates will not show Multiple Due Dates on the Discussions Index Page. However, they will show as part of the Assignments Index Page. The Discussions Index Page also does not show any due dates for graded discussions with multiple users. Note: Due dates do not apply to non-graded discussions. When you click the name of a Graded Discussion, the discussion details will also display the users and dates for the discussion. Click the Show Due Dates link. View the users and dates for the assignment. Learn how to create a graded discussion for individual students, course sections, or course groups. The Syllabus lists all Assignments according to due date, which causes assignments with multiple sections and due dates to appear more than once . 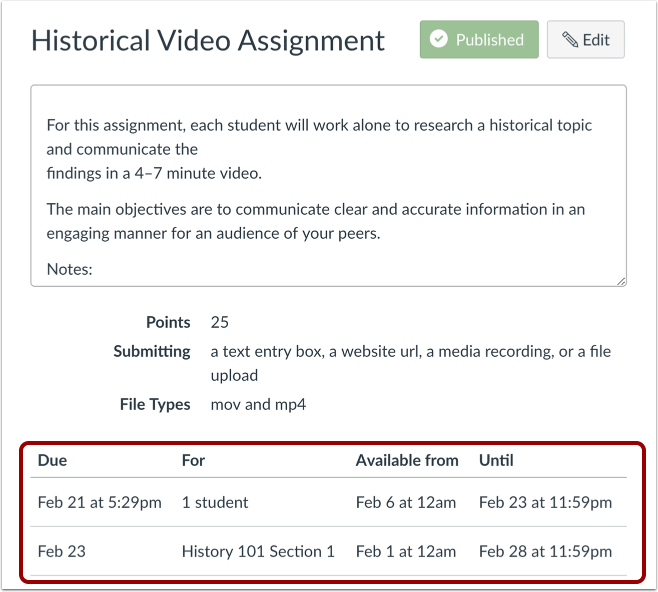 Assignments that are for everyone in the course will not have a user, section, or group associated beneath the assignment title , meaning it is due on the same date for all students and only appears once in the Syllabus. Module contents with multiple dates will only be listed once within the Module. Multiple Due Dates will appear next to the affected Module items . You can hover over multiple due date links and view each due date . The Calendar displays all Assignments according to due date, which causes assignments, discussions, and quizzes with multiple sections and due dates to appear more than once in the Month view . Assignments that are for everyone in the course will not have a user, section, or group associated when hovering over the assignment title , meaning it is due on the same date for all students and only appears on the Calendar due date. 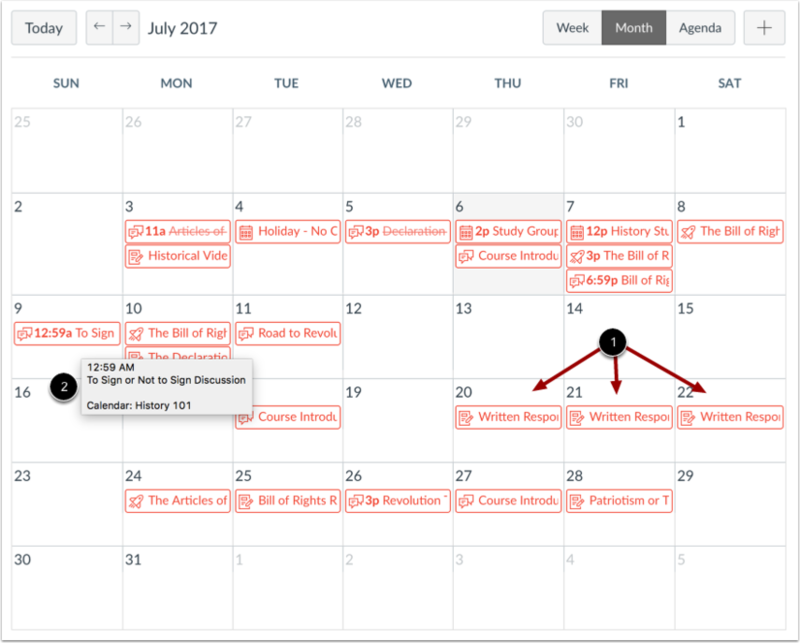 Multiple Due Dates can also be viewed easily in the Agenda view, which displays dates like the Syllabus. SpeedGrader displays the assignment as having Multiple Due Dates. View each due date by opening the assignment. Previous Topic:How do I assign an assignment to a course group? Next Topic:How do I add a grading scheme to an assignment? Table of Contents > Assignments > How do I view differentiated assignments with different due dates in a course? Re: Favorite Advanced+ Canvas Features? Re: Excuse a Section from an Assignment?